alaTest has collected and analyzed 848 reviews of VAX W85-PP-T. The average rating for this product is 4.5/5, compared to an average rating of 4.6/5 for other products in the same category for all reviews. Comments about the design and size are overall positive. The price and usability are also appreciated. Some have doubts about the reliability. We analyzed user and expert ratings, product age and more factors. Compared to other products in the same category the VAX W85-PP-T is awarded an overall alaScore™ of 90/100 = Excellent quality. alaTest has collected and analyzed 129 user reviews of VAX W85-PP-T from Amazon.co.uk. The average user rating for this product is 4.5/5, compared to an average user rating of 4.2/5 for other products in the same category on Amazon.co.uk. People are impressed by the reliability and price. The size and usability are also appreciated. Some have doubts about the design. Effective, powerful and great value. 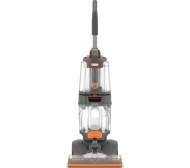 Vax Dual Power Pro (W85-PP-T) carpet cleaner. Powerful machine. Easy to use and the results are fantastic. Does everything it says on the box.